Flowers are one of the most beautiful and symbolic things in nature. Not only beautiful, they have many medicinal properities and are attributed to many different meanings. They are messages of love, mourning, friendship and longing but they are also capable of showing us the deepest secrets of your personality. Look at the image below and pick which one you think best represents you - each colour has a specific meaning and will uncover something special about you. Just like an Amaryllis you also come to life around Christmas time. Shortly before the holidays you wake up and start planning an unforgettable party for your loved ones. You are always surrounded by friends, not just because you are a fantastic entertainer but also because you are always there for the, You always have the right words to comfort them and great advice for any problem - nothing is too big or too small. This flower is symbolic of splendid beauty and is often used to represent worth beyond beauty. Just like a lily you have tonnes of energy. Your powerful aura draws people towards you. You inspire people with your energy and creativity. Things wouldn't be as much fun without you. The Lily also symbolizes purity and refined beauty. You are optimistic, curious and adventurous - the perfect mix. While you are always excited to start a new project, you are not always great on following through and prefer to come up with great ideas and leave the hard labour to other. Just like a rose you are beautiful and can show your thorns if someone gets too close to you. People like being around you because you don't beat about the bush and say what you think. The classic red rose shows that you are extroverts, brave and a very sincere person. You are always planning for the future and have big plans for yourself. You know what you want and you are not afraid to go after it but remember to sometimes take a moment to breath and enjoy the present. The black rose is a rare plant and is unique just like you. No one can copy you. You are simply one of a kind and this is what makes you unbelievably valuable! You think differently than everyone else and are always a leader, never a follower. You draw people to you but you are incredibly independent and tend to rely on yourself, not others. Don’t forget it is sometimes ok to let people in. Spring is your time of year. Even when there is still a bite of cold in the air, you blossom full of life. 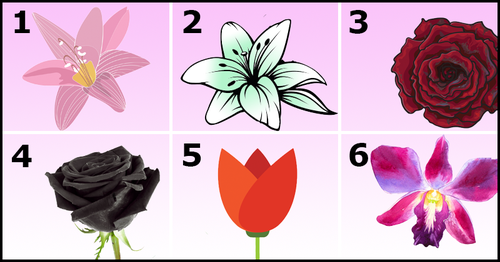 Tulip symbolizes fame and perfect love and you embody both. You are famous for your warm heart and loving nature but can be run by your emotions and be very sensitive. When you fall in love, you love with your whole heart and tend to be with your partner for life. Always remember how amazing you are and don’t let your insecurities get in the way. Just like an orchid you feel at home anywhere in the world. The queen of flowers is considered one of the most beautiful flowers. And you have one thing in common: you both are truly extraordinary. The orchid symbolizes proud and glorious femininity - important aspects of your personality. You work hard and always achieve your goals because you put in 110%. A natural problem solver - your friends often come to you for advice. You sometimes feel like you don't fit in but that is because you were born to stand out!